Envigas and Carbomax have initiated a collaboration aimed at developing carbon products for metallurgical use, which are partly based on biocarbon. Carbomax is today a leading supplier of anthracite, petroleum coke and graphite to the metallurgical industry, for slag foaming, carburization and reduction. In a demonstration plant, Envigas has shown that via advanced pyrolysis it is possible to convert forest waste or agricultural residues into high-quality bio-based carbon. The properties of the biocarbon can be controlled by the raw material and the pyrolysis process. Work is now being done on aligning the biocarbon so that it can be blended with fossil carbon in several different metallurgical applications. At present, biocarbon is produced in a demonstration plant in Bureå. Currently a full-scale production plant is constructed. 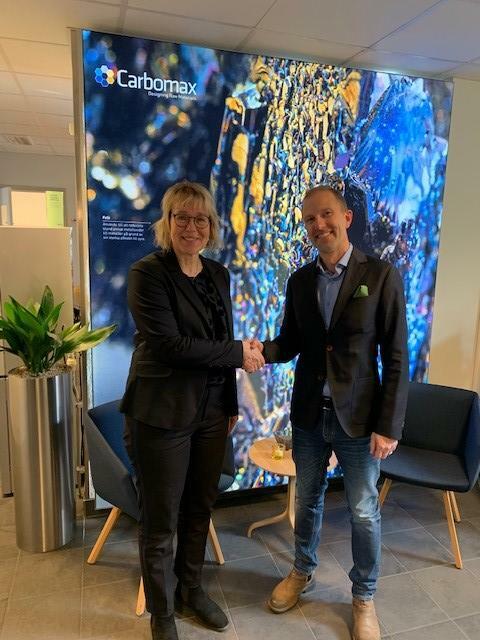 Going forward, the continued work between the parties will be focused on adapting and testing new carbon products and blends for several applications in the metallurgical industry in the Nordic countries. There is a great potential to develop carbon products with biocarbon and in this way we help the industry in terms of sustainability and competitiveness. Carbomax is a leading coal supplier that has been delivering their products to the metallurgic industry for 25-30 years. Envigas is a biocarbon and biooil producer using forest waste residuals as raw material for their process. Innan den publiceras måste den godkännas av Envigas AB.